Many of the flashlights on this site are based on the CR123a battery which is a specialty battery. But, what is the best AA flashlight? As you may already know a AA flashlight is referring to the type of battery that is used. The AA battery accounts for over 50% of all standard battery sizes sold. Since they are widely available they are more convenient than some other battery types. 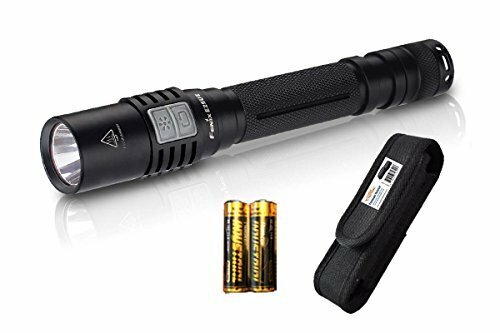 Sometimes you do not want to mess around with special batteries if your flashlight dies, you want to be able to go down to the gas station or use normal rechargeable batteries to get your flashlight going again. Lastly, many doomsday preppers like the idea of being able to stockpile standard size batteries. If you are looking for some good batteries we like the Eneloop AA Ni-MH batteries (rechargeable) and the La Crosse BC-700 charger. If you want to use primary batteries (non-rechargeable) or just want some spares lying around, the Energizer L91 AA Lithium Batteries are great. These Lithium batteries are different and safer than Li-ion and they are way better than alkaline batteries. If you want to push your flashlight to the limit you could try 14500 Li-ion batteries. 14500 batteries will fit but they run at a voltage of 3.6 instead of 1.5 Volts and can easily kill the driver or led. Before you try 14500 batteries research your flashlight and see others results. A flashlight with AA batteries can not perform to the same level as a light with CR123a without being way bigger. But, any of these lights would be a great flashlight for law enforcement as a backup to larger handheld lights or pistol lights.So when you are looking for the best AA LED flashlight we need to understand that it will not compete with the strength and size of other tactical flashlights but we can come close. For instance the brightest AA flashlight in our guide is 280 lumens with an XM-L2 bulb. A similar CR123a flashlight could produce above 600 Lumens. Here we are only talking about flashlights that use 1 AA and those that use 2 AA, I will give you my picks for both. Powered by a 1.2v AA battery, the Thrunite T10 uses a CREE XP-L V6 LED to provide a neutral white light. The Thrunite T10 NW emits a maximum of 252 lumens with a maximum beam distance of 65m and a peak beam intensity of 1,062 candelas. The Thrunite T10 uses an OP reflector with an ultra-clear glass lens with an anti-reflective coating to give the beam a perfect flood. Made from aircraft-grade aluminum with a premium type III hard anodized finish the Thrunite T10 is impact resistant up to 1m and features an IPX-8 rating. The Thrunite T10 uses a tail switch to power the light on and off. The tail switch is recessed enough to allow the Thrunite T10 the ability to tail stand. Switching between the three brightness levels offered can be done by halfway pressing the tail switch. The Thrunite T10 also features a twisty head design that powers the light and allows users another option to cycle through modes. A reversible clip allows you to clip the light to whatever is convenient. Mode memory allows the light to be turned on in the last mode used. This is a great option for every day carry (EDC) Flashlight. Both the Zebralight H53Fw and H53Fc use a CREE XP-L2 EasyWhite LED with an orange peel textured reflector. 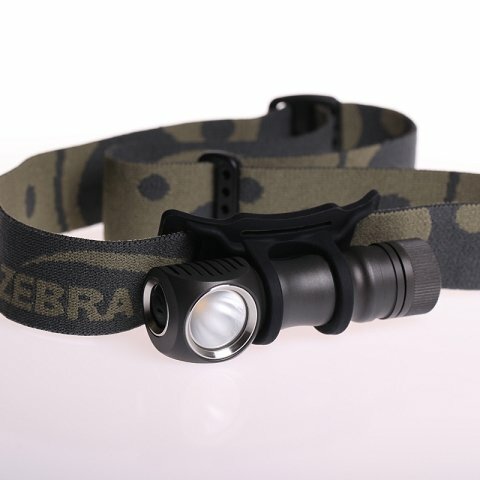 The Zebralight H53Fw can emit a maximum of 330 lumens with a minimum CRI of 80 and a 3-step tint deviation. The Zebralight H53Fc emits a maximum of 276 lumens with a CRI of 93 to 95 and a 2-step tint deviation. Another difference between the two models is the type of beam they provide. The H53Fw uses a frosted lens to provide a flood beam with a 90-degree beam spread. Both models are powered by a single AA NiMH, lithium, or alkaline battery. The Zebralight H53Fw and H53Fc offer three main brightness levels, plus a beacon and strobe mode. Each of those levels can be separated into two sub-levels and the second sub-level can be further separated to even more brightness levels. A battery indicator light on both models will flash a specific number of times to alert you to the battery power levels, all it takes is 4 short clicks to start. The lights will also automatically step down from certain levels when the power is running low to help conserve battery life. A smart user interface features a durable electronic soft-touch switch to provide you with quick and easy access to all brightness levels and beacon-strobe modes in both models. The Olight S1A is an upgraded version of the extremely popular Olight S15 Baton. Users will notice that the Olight S1A offers double the performance when compared to the Olight S15 Baton due to the TIR optic lens. The TIR lens is paired with a CREE XM-L2 LED to emit a maximum of 600 lumens. The TIR reflector provides the light with a big, defined wide hotspot that is ideal for close up illumination. The manufacturers claim with the Olight S1A there is a maximum beam distance of 118m. The Olight S1A uses an industrial silicone wide side switch to operate the light. The switch design provides the best performance and allows for easy one-handed operation even while wearing gloves. 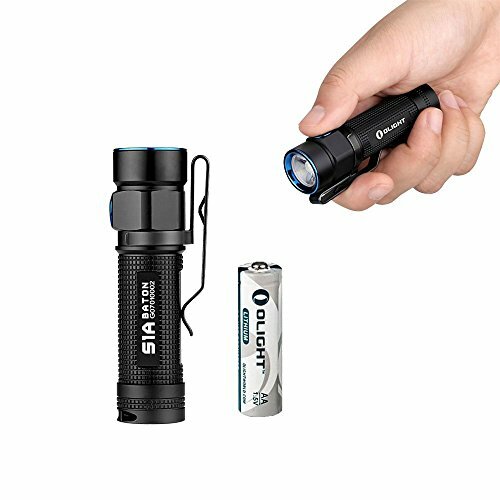 The Olight S1A can be powered by a single AA battery, but for optimal performance, you will want to use the included 14500 lithium 3.7V battery. 600 lumens can only be achieved with the 14500 lithium battery. The Olight S1A offers five brightness levels, plus strobe mode. The Olight S1A features two built-in timers, a short timer for 3 minutes and a long timer for 9 minutes. 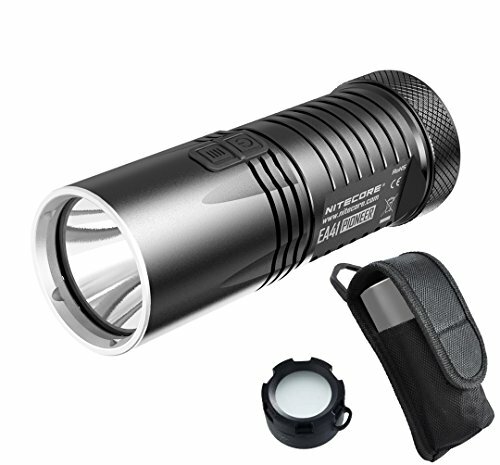 The Manker T01 II features a CREE XPL-HI LED and has the ability to emit a maximum of 500 lumens. One of the most popular tests done by individual owners of the Manker T01 II is beam distance. The manufacturer claims the maximum beam distance for this light is 282m, but tests showed a beam distance of 268m. The Manker T01 II has the ability to be powered by a single disposable AA battery or a single 14500 battery. Output will vary based on battery being used. 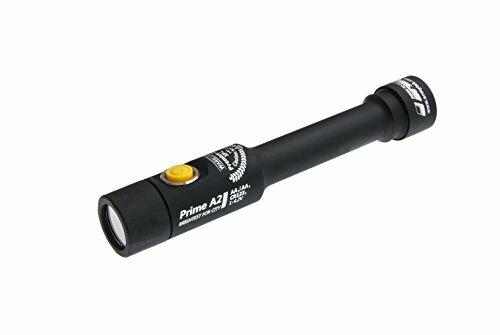 For the size this is a great long range flashlight. The Manker T01 II is made from an aerospace grade solid aluminum bar that features a HA III MIL-standard hard-anodized finish. The Manker T01 II offers an IPX-8 rating and can withstand impacts up to 2m. Controlled through a side switch the Manker T01 II offers users two operating modes: general and pro. Each of the two modes offers four brightness levels and 3 special modes. The Manker T01 II also has the ability to tail stand. The Zebralight SC5W features a CREE XP-L2 EasyWhite LED with a CRI of 83 to 85 and a 3-step MacAdam ellipse tint deviation. Powered by a single AA battery, the Zebralight SC5W can emit a maximum of 550 lumens for a period of 3 minutes. After three minutes the light will automatically step down to 407 lumens to prevent the light from overheating. The CREE XP-L2 provides a neutral white beam with an 80-degree spill and a 10-degree hot spot. Other AA lights list higher specs when it comes to lumens, but those lights are listing lumens achieved with a 14500 battery rather than an ordinary AA. The L3 Illumination L11C uses a Nichia 219B LED to emit a natural light. The Nichia 219B LED is not known for producing a lot of lumens, it is known for its ability to produce high CRI numbers. 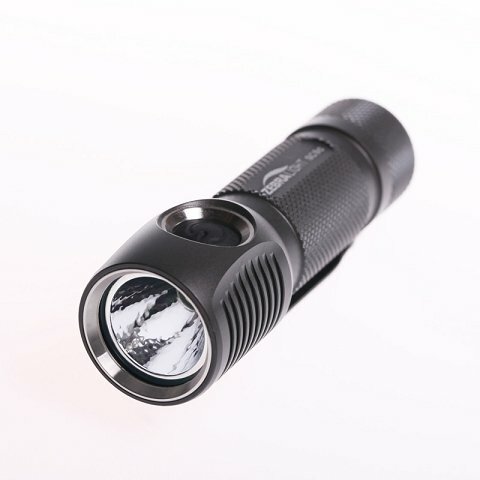 The L3 Illumination L11C offers users a 92 CRI with a maximum of 140 lumens. Controlled by a reverse click mode switch the L3 Illumination L11C scrolls through the three brightness levels offered from low to high. The L3 Illumination L11C always starts in Firefly mode allowing your eyes to adapt to the environment around you. The L3 Illumination is powered by a single AA battery. The light can use either a NiMH or alkaline battery, but not 14500 batteries. It has been shown that 14500 batteries heat up too quickly when used with the L3 Illumination L11C increasing the risk of damage to the light and the user. 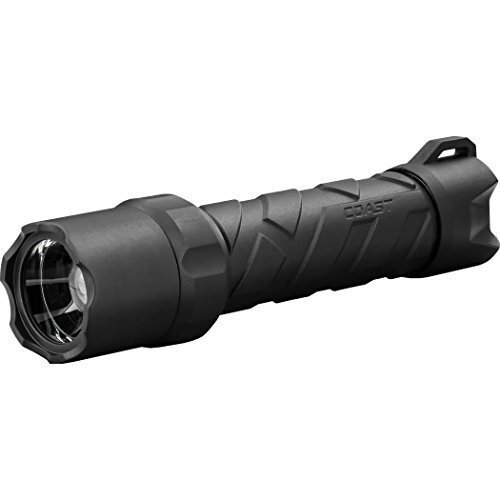 The L3 Illumination L11C offers an IPX-8 rating and is constructed from durable aircraft grade aluminum with a Premium Type III hard-anodized anti-abrasive finish. A secure pocket clip allows the light to be carried deep inside a pocket. The Reylight Pineapple and LAN lights feature a 4000K Nichia 219C LED allowing both models to deliver a High CRI number. The Reylight Pineapple is made from brass making it a little heavier than the LAN model made from titanium. The Reylight LAN offers a 10 tritium slot, while the Pineapple offers 1 slot. This allows you to add in trits to customize the light. Both lights feature an AR coated lens with an aluminum alloy orange peel reflector. Controlled via a clicky switch located on the tail of the light both models have the ability to tail stand. With the Reylight Pineapple and LAN users have the choice between three brightness modes, plus a true moonlight mode of only 0.2 lumens. When first turned on, both models will start in moonlight mode to preserve night vision. Once the lights are powered on, users can cycle through the brightness modes until the desired amount of lumens is reached. Both the Pineapple and LAN models can use a 14500 battery in place of an AA. Using the 14500 battery will increase the maximum lumens to 390. Using the 14500 causes the light to get extremely hot and increases the risk of damage occurring. The Thrunite Archer 2A V3 NW is an updated version of the Thrunite Archer 2A V2. The Archer 2A V3 uses a CREE XP-L V6 LED to emit a maximum of 430 lumens with a beam distance of 161m. The high-efficiency LED emitters used with the Thrunite Archer 2A V3 produce a neutral white light with a beam pattern that ensures good overall visibility. If you are not a fan of the neutral white light, the same Thrunite Archer 2A V3 is also available in cool white. The Thrunite Archer 2A V3 NW utilizes a two-button interface. The tail switch provides power to the light and activates the momentary on function. The side button allows users to cycle through the four brightness levels and provides access to the hidden strobe mode. The Thrunite Archer 2A V3 NW can use either AA or 14500 batteries. Made from a aerospace grade aluminum body the Thrunite Archer 2A V3 NW offers overheat and reverse polarity protection to prevent the light from becoming damaged. The Zanflare F2S uses a high-quality CREE LED bulb to emit a maximum of 200 lumens of cool white light. An ultra transparent mineral glass lens is treated with an anti-reflective coating to improve reflector performance. The Zanflare F2S also combines Crystal Coating technology with their precision digital optics to offer high reflector performance. The Zanflare F2S can be powered by either 2 AA disposable batteries or 14500 Li-ion batteries. An indicator light on the Zanflare F2S works as a low battery indicator. The battery indicator starts alerting users once power levels have dropped below 30%. The tail switch button provides power to the light and allows users to switch between 3 brightness settings and strobe mode. The memory function allows the Zanflare F2S to turn on in the last setting used. The Fenix E25UE is Fenix’s first ultra bright light that is powered by 2AA batteries. The Fenix E25UE uses a CREE XP-L LED to emit a maximum of 1000 lumens with a published maximum beam distance of 200m. Users can opt for two rechargeable 14500 Li-Ion batteries or two Ni-MH or Alkaline AA batteries. Output and runtimes will vary based on the batteries being used to power the light. The Fenix E25UE features an intelligent drive circuit that will detect what batteries are being used and alter the output levels accordingly. The Fenix E25UE uses a dual side switch for all operations. The side switch allows users to cycle through up to 5 brightness modes and two special modes. A digitally regulated output ensures constant brightness in all settings. To protect the light from overheating the light will automatically downshift from Turbo to High after a limited time of operation. Made from durable aircraft-grade aluminum with a type III hard-anodized anti-abrasive finish the Fenix E25UE features an ultra-clear glass lens with an anti-reflective coating. The Armytek Prime A2 V3 uses a CREE XP-L White LED to emit a maximum of 850 lumens. The light provides a peak beam intensity of 5080 candelas with a maximum 143m beam distance. Using an efficient TIR-optic, users will not experience any “tunnel vision” even after using the light for an extended period of time. The TIR-optic provides a beam with an 80-degree spill and a 20-degree hot spot. Powered by two AA batteries the Armytek Prime A2 V3 offers a built-in low battery indicator, a multi-color LED indication, and auto-memorization of the last mode used. In 2015, Nitecore released the newest version of the Nitecore EA41. 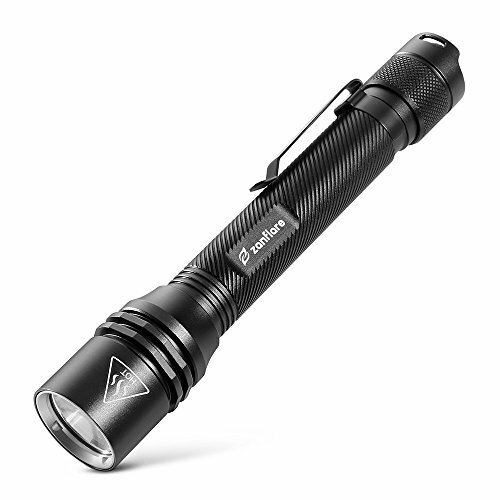 The 2015 version of the Nitecore EA41 uses the same CREE XM-L2 U2 Led as in previous models. The LEDs allow the Nitecore EA41 to emit a maximum of 1020 lumens for 1 hour and 45 minutes. With the use of Precision Digital Optics Technology the Nitecore EA41 delivers exceptional reflector performance for a maximum beam distance of 376m. Powered by 4 AA batteries the Nitecore EA41 provides users with five different brightness levels, plus SOS, beacon, and strobe modes. The compact light is rather simple to use as it comes with two different switches, one for powering the light on and off and the other for switching between the different modes. The mode switch provides users with direct access to both strobe and turbo modes. A power indicator light located behind the dual switches alerts users to remaining battery power and serves as a location beacon. The Nitecore EA41 offers a sturdy and durable hard-anodized HAIII military grade body with a mineral glass lens featuring anti-reflective coating. The Coast Polysteel 600 offers a pure beam focusing optic for optimal up close or far away illumination. The Coast Polysteel uses their largest Ultra View Flood Beam combined with a Bulls-Eye Spot Beam. The Ultra View Flood Beam provides a circle of consistent light that measures 11.5 in diameter at 6 feet away. The Bulls-Eye Spot Beam features a maximum beam distance of 234m with a transition halo to increase the effective viewing area. Shaping the beam of the Coast Polysteel 600 is done simply by twisting the head of the light. The Coast Polysteel 600 features a stainless steel core inside a fiberglass-reinforced polymer body. This durable body allows the light to survive a drop from up to 3m. The Coast Polysteel 600 can be fully submerged in water up to 3 meters deep for a period of 1 hour without incurring any damage. Using a click switch located on the tail end of the light the Coast Polysteel 600 offers users the choice of three brightness levels with a maximum of 710 lumens. 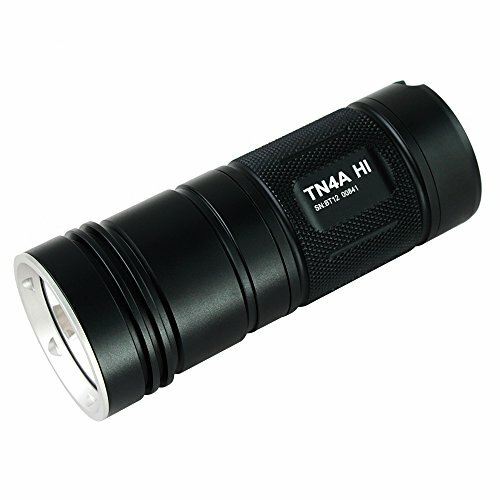 The Thrunite TN4A HI is a powerful thrower flashlight that uses a CREE XP-L HI LED to emit a maximum of 1050 lumens. Independent tests measure the maximum beam distance of the Thrunite TN4A HI at 346m. The compact thrower achieves the high-quality beam with a smooth peel reflector paired with an ultra clear tempered glass lens with an anti-reflective coating. Powered by 4xAA batteries the Thrunite TN4A uses an advanced electronic switch for silent operation. With the Thrunite TN4A users have the choice of four brightness levels, plus strobe and firefly modes. Firefly mode can be accessed instantly when the light is off. To prevent the light from overheating Thrunite uses an intelligent temperature control technology to automatically lower the current when the temperature reaches 176 degrees Fahrenheit. A battery indicator light will change from bleu to red to alert users when the batteries need replacing. Memory function allows the light to be turned on in the last setting used with the exception of Firefly, Turbo, and Strobe. Using a CREE XHP35 HD LED the Manker MK41 offers a neutral white and cool white version. The Neutral white version has a 20% less output than the cool white version. The cool white version uses the ND LED with a maximum output of 1500 lumens. The neutral white version utilizes a HI LED with the ability to emit a maximum of 1280 lumens. 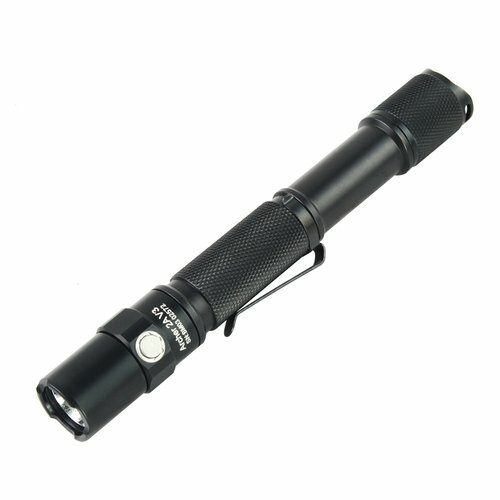 The Manker MK41 Cool White has a maximum beam distance of 389m with a peak beam intensity of 38000 candelas. The NW version offers a maximum beam distance of 410m with a peak beam intensity of 43400 candelas. 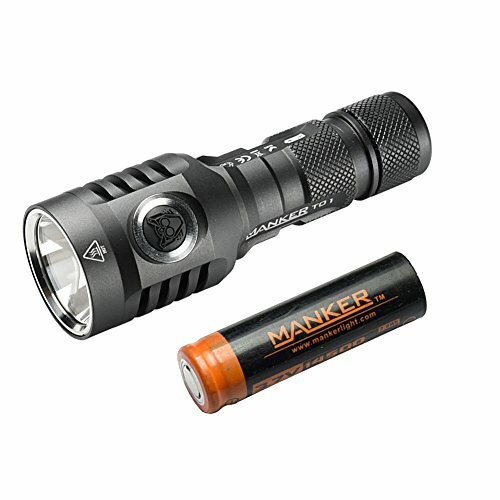 The Manker MK41 can be powered by 4 AA batteries or 14500 lithium-ion batteries. The 14500 batteries allow for a higher output and a better throw, but runtimes are drastically reduced. 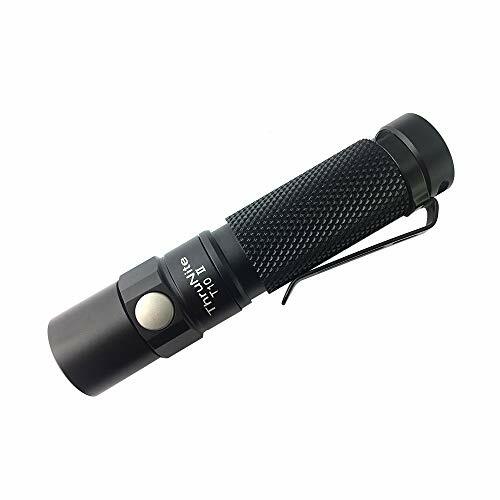 Using a side switch the Manker MK41 offers users four brightness levels to choose from, plus SOS and strobe modes. The Manker MK41 will operate for a maximum of 5 minutes at 1500 lumens before stepping down to 750 lumens. There are many other AA flashlights on the market but these are the ones that I feel are the best AA flashlights. 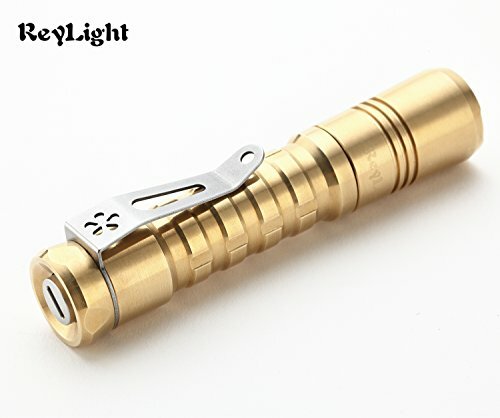 If you want a flashlight with higher Lumens or one that is bigger you should just go for a flashlight with CR123a batteries for a smaller flashlight look for one with a single AAA battery. Thank you for reading this “Best Of” article please take a look at our other Best Flashlight articles. Please also take a look at our GIANT Flashlight Comparison Guide where you can filter flashlights down to the specifications that you want. If you are new to flashlights and are not sure about some of the vocabulary here please read our tactical flashlight buyers guide. Also, if you liked the content here please follow one of the links where the flashlights are on sale on Amazon. Our site is funded by a small commission that we receive from Amazon when you purchase something after going through one of our links, all of this is at no extra cost to you. Thank you for your support.